Put parsley into mixer bowl, chop for 4 sec/speed 6/MC on. Set aside. Without washing the bowl, put shallot into mixer bowl, chop for 3 sec/speed 6/MC on. Scrape bowl down and repeat. Insert butterfly and add white wine vinegar, dijon mustard, salt and black pepper to mixer bowl. Set mixer to 2 min/speed 3/MC off and VERY slowly start drizzling oil in to mixer bowl. Set aside. Without washing the bowl, weigh in 500 g or 17.6 ozwater. Put quartered potatoes in to simmering basket and steam for 17 min/steaming temperature/speed 2/MC on. When potatoes are cooked, but still firm, remove the simmering basket from mixer bowl and rinse under warm water. Drain water completely. While the potatoes are still warm, stir through the reserved dressing, onions, add salt to taste and garnish with reserved parsley. Serve warm. At step 4 use ST temp and speed 2 if using an Intelli, and 130°C or 270°F and speed 2 if using a Supercook. Extend cooking time if necessary. Love this salad! Very easy but so delicious. Have made it a few times. I love this, I have made it a few times now, perfect for a side dish for summer barbecues. This was simple and tastes really good! I made this for the first time tonight. We had some bad luck with the meat, it was off 🙁 I was very upset but hubby told me he was very happy to eat it for his mains because it was really delicious! I made this for the first time on Christmas Day. So simple and lovely flavours that are a bit different than the standard salads you usually have. I love that I can make any of your recipes and just know it’s going to be great! Great recipe served warm, or cold/room temperature. Beautiful, quick and easy salad!! first time my whole family has liked a potato salad recipe – thanks Nik! I mistakenly added all the olive oil before starting the butterfly and it still turned out fantastic!! I doubled the shallot and mustard too. By the way, is the red onion meant to be cooked or just as garnish? It’s not mentioned in the directions. Loved this! So quick and easy. I added bacon to please husband. Also served cold as I made it the day before. Thermie sceptic husband had two serves, 3 year old ‘wait mum! I’m not finished my dinner’ loved it and two year old ate the lot! Will be on regular rotation 🙂 thank you! 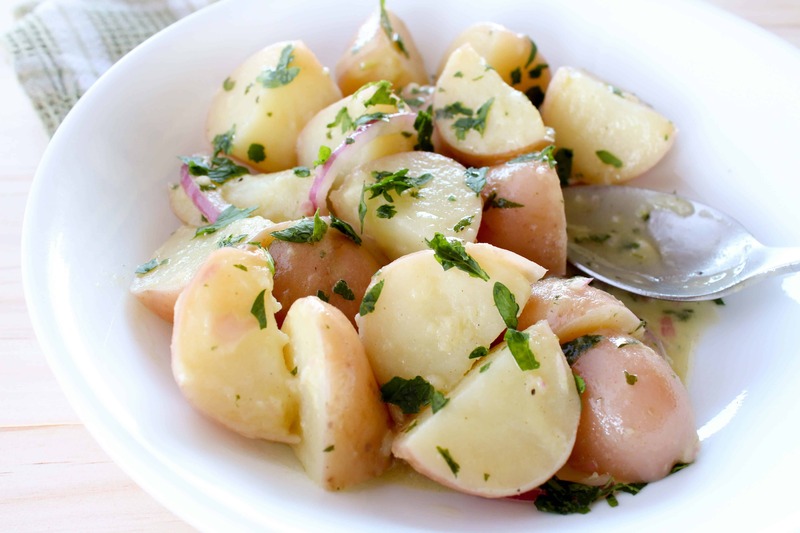 Amazing potato salad !! Will be making again for sure . Once again another delicious and easy recipe. Thanks Nikalene you are amazing!! Just made this delicious potato salad and your chicken Za’atar, both for the first time. Will definitely make them both again. You are a star Nik. Many thanks. This looks so good! Much healthier than the normal potato salad. I think the dressing would lovely in a cauliflower salad too. OMG this is our (okay) my go to side dish for meals. I am not a huge potato fan but this is AMAZING…I have been known to eat it for lunch and dinner until it has gone. It also reheats really well (I will at times reheat to have it warm for lunch). Sounds like an interesting variation, I would love the recipe! Quick and easy recipe. Even the kids like it. I’ll be making again. Fantastic again Nikalene. We had this with our BBQ tonight and it was great, and so quick to make. 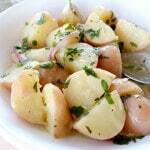 This is an amazing tasting potato salad, everyone in the family just loved it. Was very easy to cook. Thanks for the great recipes. Delish! Couldn’t get baby reds so used what baby pots I could get and it was great. If I was making ahead I’d make a little extra sauce as it absorbed. Either that or add once I’d reheated.